Thinking of taking Mom to Brunch for Mother’s Day this year, consider the gift of a sweet treat in bed instead. Growing up, Grandma and Mom were the masterminds behind all of our most-loved recipes. With that in mind, here are two delicious recipes from local author STACY HARRIS for keeping Mom’s special day easy and breezy – for everyone. 1. Slice each stick of butter lengthwise into three pieces (6 in all). Sprinkle a little ﬂour over a piece of parchment paper measuring approximately 26 x 15 inches. Place the butter in a horizontal row in the middle of the left half of a the parchment paper. Fold the other half of the parchment paper over the butter. This will keep the butter from sticking to the rolling pin. Roll the butter into a ﬂat sheet about 1/8 inch thickness. Place the butter sheet into the refrigerator. 2. In a stand mixing bowl ﬁtted with the dough hook add ﬂour, 3 tablespoons of sugar, and the salt and mix on low until combined. 3. In a small bowl, combine the water, yeast and 1 teaspoon of sugar and let it sit for about 15 minutes. 4. In a medium bowl, add the milk, egg, and vanilla and mix well. 5. Pour the milk mixture and the yeast mixture into the ﬂour and knead the dough for 7 to 8 minutes. 6. Turn the dough onto a lightly ﬂoured surface and roll dough to approximately 20 x 20 square. Remove the butter from the refrigerator and place 1/2 of the butter sheet over the right side of the square.You may have to remove the butter with a scraper. Cover the butter with the right side of the dough. Place remaining butter on the bottom half of the dough and cover with the top half of the dough. Pinch all the sides of the dough to keep the butter from coming out of the sides when you roll the dough. The key is to get thin layers of butter throughout to create a ﬂaky dough. 7. Roll the dough to about 1/2 inch thick, then fold into thirds just as you would fold a letter. Repeat three more times. The last time leave folded like a letter and put the dough in a ziptop bag in the refrigerator for at least one hour. I like to put mine in overnight and have dough ready for the next morning. Remove dough from the refrigerator and place on a ﬂoured surface. Roll dough to 1/8 inch thickness creating a 24 x 24 inch square. Cut the dough into 1 inch strips. With one strip of dough, beginning with the ends, twist the dough in opposite directions. When the dough is spiraled, roll one end continuously to reach the other end until you have formed a pretty cylinder. 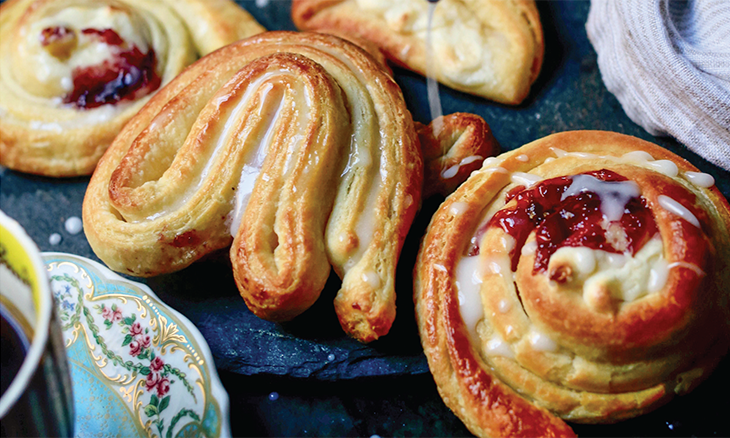 Place each danish onto a piece of parchment paper on top of a cookie sheet and allow to rise for one hour. Cut the dough into 6 x 6 squares. Place cream, pastry cream, or jelly diagonally in the square. Fold the sides without the ﬁlling over the ﬁlling and seal the pastry together with an egg wash.
Place each danish onto a piece of parchment paper on top of a cookie sheet and allow to rise for one hour. Baker’s Note: The scraps that you cut away from the pastry dough to form a square can be used for amazing dough in monkey bread or you can form it into balls, sprinkle them with cinnamon and sugar and bake until golden. 1. Pre-heat oven to 400 degrees. Combine dry ingredients in a large bowl. In a separate bowl, mix milk and sweet potatoes until combined. 2. Cut frozen butter into small cubes and blend into the ﬂour mixture using your ﬁngers. Take care not to melt the butter (handle as little as possible). Add wet mixture into the dry and lightly mix dough with your hands to combine. Bring the mixture together and once together turn out onto a ﬂoured surface (the dough will look very shaggy). Press it into a 9 x 6 rectangle (approximately 2 inches thick). Cut the dough into rounds. 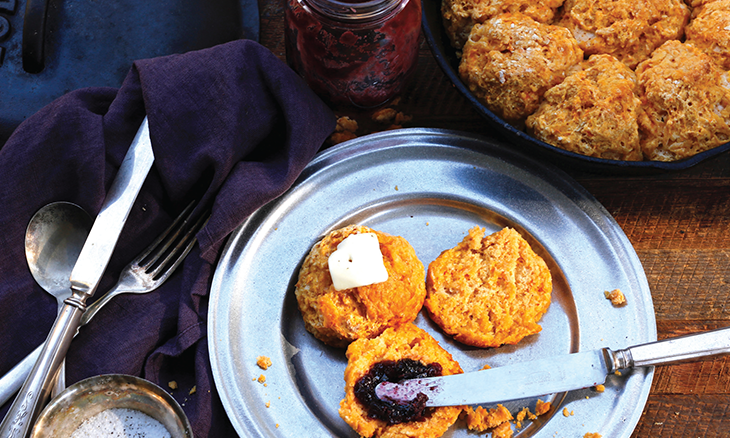 Gather leftover dough, and repeat until you have 8 large biscuits. If you want a lot of small biscuits, roll dough out to 3/4 inch thickness and cut biscuits using the size cutter you would like. 3. Place biscuits in a skillet and bake until bottoms turn golden brown, about 12 to 15 minutes. 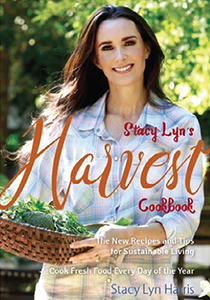 Stacy Lyn Harris is the bestselling author of three cookbooks, founder of the popular Game and Garden blog, and a co-host of “The Sporting Chef” and “Rural Heritage.” Her simple approach to sourcing and preparing delicious meals makes life easier for those who want great fresh food everyday. For more information, subscribe to her websites, stacylynharris.com and gameandgarden.com, and follow her on your favorite social networks @stacylynharris.